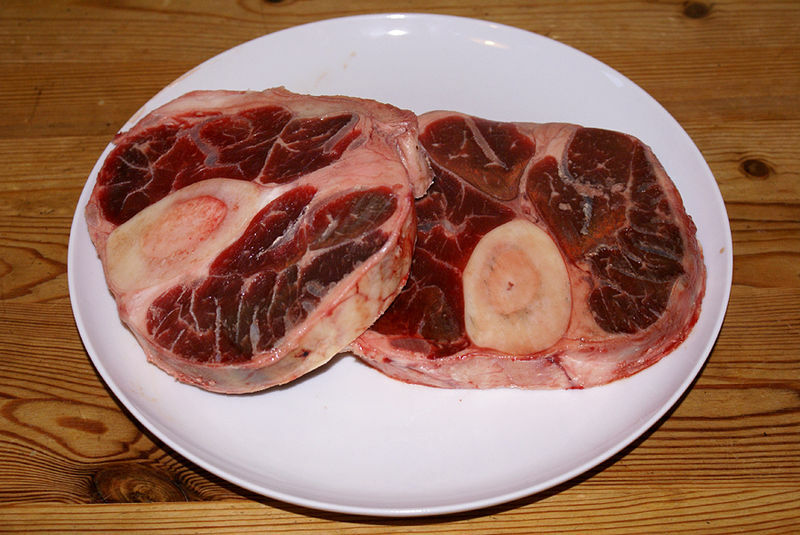 Ossobuco alla milanese is a dish from Milan, Italy, capital of Lombardy, of braised veal shanks. The veal is usually sprinkled with gremolata, a mix of parsley, garlic and lemon peel, and served with risotto alla milanese, a risotto enhanced with saffron threads. Left: Well braised ossobuco made with veal shank, white wine and different kind of herbs. The shank is cut across the bone into slices about one inch thick, browned, and braised in white wine and herbs. 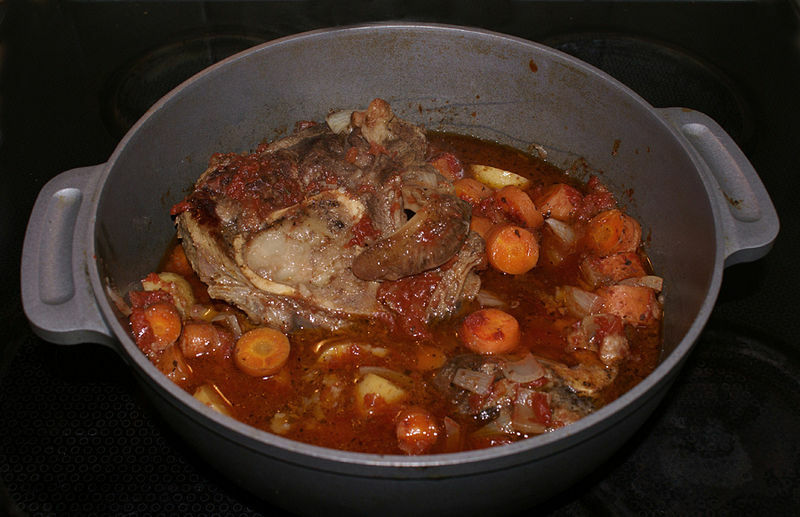 Ossobuco was formerly made without tomatoes (these being unknown in Milan until the late 19th century). That tomato-less version is prepared with cinnamon, allspice, bay leaf and gremolata. It has by and large been replaced with the newer version which includes tomatoes, carrots, celery and onion, flavoured with a bouquet garni and without gremolata (although 'hybrid' versions exist which include both tomato and gremolata). In the modern Italian version of this dish, ossobuco is often served with risotto alla milanese, one of the few cases where a grain and meat dish are served together. Other risotto rice side dishes may be used as well. The shank is called osso buco in Italian, lit. 'hole bone', because the bone marrow is part of the appeal of the dish. Left: Veal shank used for ossobuco.